There is a steady rise in the growth of the aging population in countries such as Japan and Singapore and an increase in prolonged diseases in China, India, Vietnam, the Philippines, Thailand, and other countries in Asia Pacific. The geriatric population is also rising in Europe and North America. This is leading to a rise in the number of healthcare facilities, which in turn is boosting demand for healthcare facility management services. In terms of geography, the global healthcare facility management market has been divided into North America, Europe, Asia Pacific, Middle East &Africa, and South America. This report on the global healthcare facility management market provides analysis for the period 2016–2026, wherein 2017 is the base year and the period from 2018 to 2026 is the forecast period. Data for 2016 has been included as historical information. The report covers market dynamics including drivers, restraints, opportunities, trends, and technology advancements that are expected to influence the expansion of the healthcare facility management market during the said period. The study provides a comprehensive analysis on market growth throughout the above forecast period in terms of value estimates (US$ Mn) across different geographies. A major opportunity in the global healthcare facility management market exists in “Green Cleaning.” Mature healthcare facility management markets such as North America and Europe are in the forefront in the adoption of green cleaning technologies and methods. In Asia Pacific, developed countries such as Japan and Singapore and developing countries such as Taiwan, China, and India are expected to increasingly adopt green cleaning standards. Singapore’s SGBC (Singapore Green Building Council) is promoting green cleaning standards in the healthcare facility management market in Singapore and other Asia Pacific countries. China which is the largest healthcare facility management market in Asia Pacific has already launched an actionable plan for green cleaning standards way back in 2013. The regulation mandates all public residential and commercial buildings, including hospitals, bigger than 20,000 square meters to achieve at least one star in China’s green building evaluation standard. China has set an ambitious target to reach one billion square meters of certified green buildings by 2020. Thus, healthcare facilities in China are increasingly moving to green building standards and prefer facility management service providers equipped with the knowledge of green building technologies and standards. Therefore, it is expected that green cleaning will provide a major opportunity for expansion of facility management in the healthcare sector in Asia Pacific and other regions. Based on the type of service, the global healthcare facility management market is segmented into hard and soft services. Hard services can again be sub-segmented into various non-core healthcare services such as plumbing and air conditioning maintenance, fire protection systems, mechanical and electrical maintenance, and other hard services such as fabric maintenance. Soft services can be sub-segmented into cleaning and pest control, laundry, catering, security, waste management, and other soft services such as administrative services. 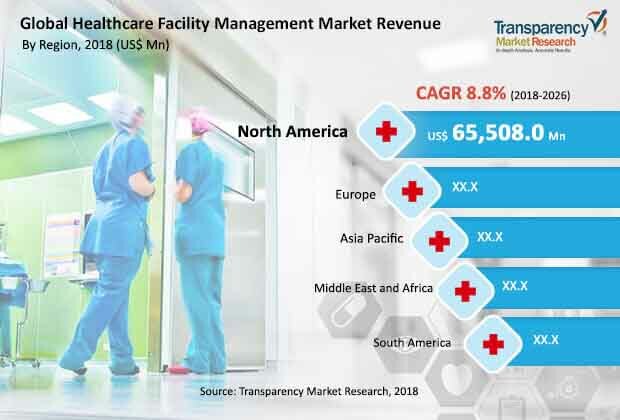 Although the global market size of soft healthcare facility management services is expected to be more than the hard healthcare facility management services, nevertheless, hard services are anticipated to witness a higher growth rate than soft services during the forecast period. Geographically, the global healthcare facility management market is divided into regions such as North America, Europe, Asia Pacific, Middle East & Africa, and South America. The regional healthcare facility management markets have been analyzed in terms of value in US dollars (US$). Prominent countries profiled in the report include the U.S, Canada, Germany, the U.K., France, China, India, Japan, Malaysia, Singapore, Taiwan, Indonesia, Vietnam, Philippines, Thailand, GCC, South Africa, and Brazil. The report also includes key technological developments in the healthcare facility management market. The report includes Porter Five Force analysis, which highlights suppliers’ power of influence, buyers’ power of influence, threat from new market players, any threat of substitution, and level of competition among healthcare facility management service providers. Value chain analysis, identifying raw material suppliers including third-party raw material suppliers, healthcare facility management service providers, and end-use industries (healthcare) is also covered in the report. Regional trends and each segment’s incremental opportunity analysis have also been added in the report. The report also covers incremental opportunity analysis of a segment’s attractiveness on the basis of market share index and CAGR across North America, Europe, Asia Pacific, Middle East & Africa, and South America. In Asia Pacific, we have provided incremental opportunity analysis of hard and soft services of China, India, Japan, Malaysia, Singapore, Taiwan, Indonesia, Vietnam, the Philippines, and Thailand. The report also includes market share analysis of major players operating in the global healthcare facility management market based on their 2017 revenues, competition landscape, which includes competition matrix, and geographical spread. The report benchmarks leading companies on the basis of their capabilities and potential to grow. Factors including R&D focus are attributed to a company’s capabilities, market position, and offerings. Factors including revenue growth, market share, segmental growth, infrastructure facilities, and future outlook are attributed to a company’s’ potential to grow. Company profiles of major players include overview of company, major business strategies, and key developments. The companies profiled in the global healthcare facility management market include ABM Industries Inc., Aramark Corporation, Compass Group plc, Ecolab, Inc., ISS World Services A/S, Jones Lang LaSalle, IP, Inc., Manutencoop Facility Management S.p.A. (MFM), Medxcel Facility Management, Mitie Group plc, OCS Group, Secro Group plc, Sodexo, Vanguard Resources, and UEM Edgenta Berhad.